This is a view of "Royal Oak, Mich., Main Street" looking south from Third Street (larger size). It comes from an antique, beautifully hand-colored postcard. Such a card was postmarked Sept. 1, 1909, 7 a.m. It was sent by Ruth Kidder, to "Mrs. Flora Kidder, Alden, Erie County, N.Y." Postage was paid with a 1 cent Ben Franklin stamp. The card was published in Pontiac, but was "made in Germany". Main Street from an old postcard, looking south of Third Street (1909). The brick building on your left with the large awnings is the Roy Building. Large posts at the front protect it from street activity. This building houses the William H. Tolles and Joseph W. Unger meat market and Mrs. Lochbihler's dry goods shop, where my great aunt Grace Penney worked as school girl. The Edison Company is beyond this; next a tall building with a bay window, the offices of George A. Dondero, lawyer (later to become first mayor of the City of Royal Oak); Joseph S. Morrison, M.D. (much respected doctor); Dr. Moffett, dentist; and the telephone exchange. Just beyond this building at the horse and wagon, is a bakery built in 1902, and at one time operated by Gus Dondero. Now known as Herman's Bakery, it is the oldest commercial building remaining on Main Street. Further along on the east side of Main is the town pump and weighing scales, Smith & Blair drug store, Royal Oak Coal & Coke Co., and on the corner at Fourth Street, Gus Dondero's saloon. This building later housed Codlings' clothing shop. Three years later on November 24, 1912 this side of Main between Third and Fourth will be heavily damaged by fire. Many of the buildings will be rebuilt from the ground up. Approaching you on the Rochester, Romeo, and Lake Orion Street Railway tracks, is an electric trolley that has just turned north after coming east on Fourth Street. 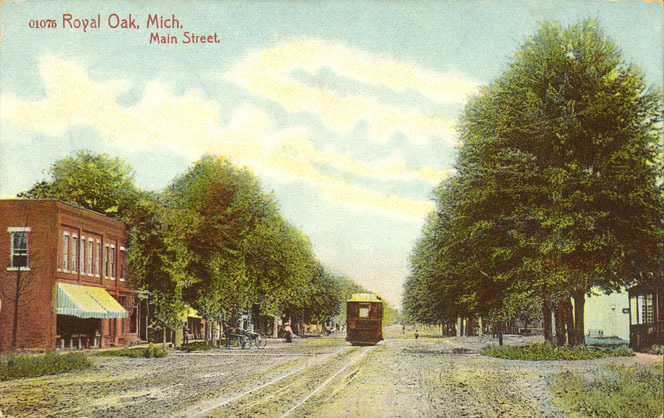 This transit line, along with the railroad, which crosses Main Street 3 blocks further south, was extremely important to life in the growing Village of Royal Oak at the turn of the century. You see large trees on the west side of Main. They obscure your view of the tall spire of the first St. Mary Roman Catholic Church, a traditional wooden structure built in 1889, located at the northwest corner of Fifth and Main. As well as being rung to call the parishoners, its bell was used by the Village to summon volunteers for fires and other emergencies. The trees also prevent you from seeing the large wooden barns of the Mellen-Wright Lumber Company just beyond the church. The Julius Braun family home and blacksmith shop were located in the same block as St. Mary church. Both were later demolished. Fifteen years later, 1924, this became the site of the imposing new Royal Oak Savings Bank building and offices. Closer to you on the west side of Main you can see the Town(ship) Hall at the northwest corner of Main and Fourth. It was built by my great great uncle Benjamin M. Knowles in 1870 when he submitted the low bid of $1664.00. Dr. Anderson's office is located further north along Main Street. Turning to your right, you see the First Baptist Church building at the northwest corner of Main and Third. This church was later used as the second Town(ship) Hall, then the first City Hall, and is now the home of the Royal Oak Woman's Club. It was finally moved to Fourth and Pleasant in 1928. The scene we see in this old postcard has all but completely changed today - the street is paved and curbed, small decorative trees shade wide concrete sidewalks, and horses and buggies are no more. With the exception of the Herman's Bakery building, virtually all of the buildings have been replaced. While our town may seem to change little in a year or two, it has changed almost totally in ninety.